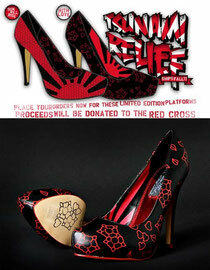 New Iron Fist Platforms designed as a way to assist the Red Cross in their efforts to provide relief in Japan to those affected by the Tsunami in March 2011. Relive your favorite Hollywood ocean thriller and slip on these spunky pumps from Iron Fist. Here I Lie has a multi colored upper with shark andnautical tattoothemed patterns. A 1/2 inch black patent platform and 4 1/2 inch heel complete this exhilarating peep toe. The back of the heel and front of the peep toe have an unusal raised dot pattern on the faux patent covering making this a really interesting shoe...esp for the price!!! This design features a shiny print of anchors, nautical stars and skulls on black soft leather look PVC material. Also these shoes have a bright red heel and a bow at the front. These shoes have a authentic sailor touch and will complete any of of your retro outfits. The Bowed Over is a stunning Rain Boot from Iron Fist. Featuring a waterproof upper with black bows on a pink boot design and a vinyl bow on the ankle of each boot. With an approximate height of 8.3 inches it is ideal for any leg shape. The sole unit has good tread for traction and grip and the removable insole provides extra cushioning. Wear the classiest skull heels everwith these Bowed Over Platforms from Iron Fist. The Break In platform pump by Iron Fist will bring all the sailor boys to you. This shoe has a Red & black striped canvas upper, a 4 3/4 inch black patent PU stiletto heel, and a 1 inch black patent PU platform. 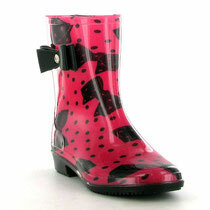 A black and red polka dotted bow, finished with an dangling metal skull charm, complete these amazing shoes! This platform heel from Iron Fist features the "Frak Attack" Frankenstein print with a black velvet bow at the back, and monster stitching down the backs of the heels. These Iron Fist Hot Mesh Distressed Fishnet Lace Up Platform Heels are amazing. All Man Made Materials, Vegan Friendly! The shoe also has a hot pink metallic ankle strap, matching liner inside and for added detail hot pink on the bottom of the heel. 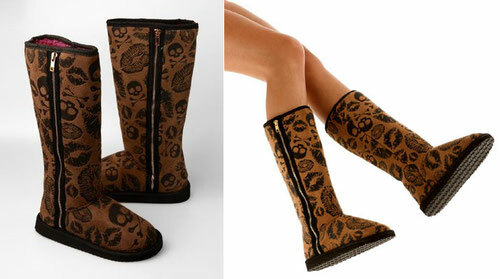 The Kiss of Death tall fugg boot from Iron Fist comes complete with a full length gold zipper.The boot features skulls and kisses on animal print inspired background. With these boots you won't be able to wait for the cold weather to start! ●Wear the classiest skull heels everwith these Lacey DaysPlatforms from Iron Fist. ●Lacey Days features a 5 inch heel with a hot pink upper patterned with skulls and lace details. A closed toe 1 inch platform, bow, and pink skull charm complete these adorable heels. 1" concealed platform with a 3.5" heel. 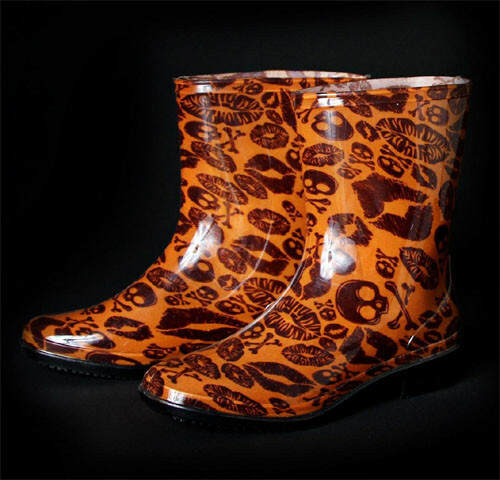 Ankle booties featuring embossed all-over Iron Fist Manslayer skull print. Studded wrap around belt detail. 100% Vegan! Non-Leather tall "fug" boot! Check out the gray and black understated repeat skull pattern and the 3 buckles going up each side w/ an additional belt accent around each ankle...very cool and will keep you toasty!